In what was perhaps the biggest game of the season for the No. 20 Boston University men’s hockey team, the team’s freshmen showed that they could play on the big stage and propelled the Terriers (19-13-4, 12-8-4 Hockey East) into the Hockey East semifinals after beating the University of Connecticut 2-1, completing the sweep of the Huskies (15-19-2, 11-13-1 Hockey East). But getting production out of the “puppies” is nothing new for the Terriers — especially this season. BU head coach David Quinn noted that the freshmen are a big reason for the way the team has been playing the second half of the season. BU’s roster features five freshmen who were selected in the 2017 NHL draft and one freshman who is regarded as a top prospect for this June’s draft in forward Brady Tkachuk. During the regular season, the freshmen combined for 109 points, which led all four of the Terriers’ classes. They were led by forwards Shane Bowers and Tkachuk with 27 and 26 points respectively which put the duo second and third in Hockey East and tied for seventh and ninth nationally. Both found their way into the box score in game two of the Hockey East quarterfinals against the Huskies. With four seconds to go in the first period, Tkachuk scored the team’s first goal while on the power play. 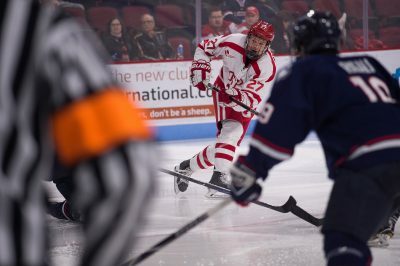 Sophomore defenseman Dante Fabbro found Tkachuk in the right circle, and Tkachuk released a shot that Huskies’ sophomore goaltender Adam Huska could not save to give the Terriers a 1-0 lead. However, the freshmen class was not finished. With three minutes and eight seconds to go in the middle stanza, forward Logan Cockerill connected on a pass from Bowers from the right slot for his seventh goal of the season to put the Terriers up 2-1. The goal extended Cockerill’s point streak to an even 10 games. The line of Cockerill, Bowers and junior forward and assistant captain Bobo Carpenter is a line that Quinn thinks plays a major role in the team’s recent success. The freshmen also showed up big during the first game of the the series. Defenseman Kasper Kotkansalo, Tkachuk, Cockerill and Bowers all recorded helpers during the Terriers 5-4 victory in overtime, with Bowers picking up assists on the Terriers final two goals of the contest. Even though Bowers picked up three assists this weekend, scoring goals is something he is more than capable of doing. His 16 regular season goals had him second on the team trailing Carpenter — a mark that placed him first in the conference and third nationally. 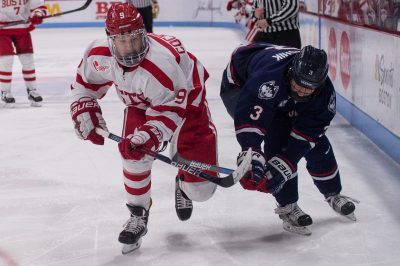 The Terriers will take on Boston College Friday for the Hockey East semifinals matchup. Senior defenseman and captain Brandon Hickey said the freshmen class already has experience in playing in big games. Wow! This celebration greeting is fantastic! Appreciate you for sharing.